1. 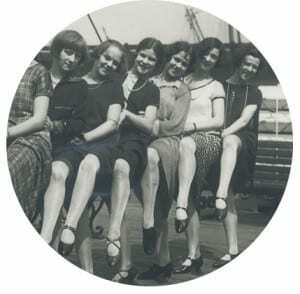 The Rockettes were inspired by John Tiller’s “Tiller Girls.” The Rockettes began kicking up their shoes since Russell Markert, the Rockettes’ chief choreographer, image-preserver and resident “father figure” of the famous troupe until he retired in 1971, founded the exemplary American chorus line—an exciting precision dance company with great style, flair, and glamour—in 1925. Inspired by the British dance troupe formed by John Tiller (“The Tiller Girls” performed in a 1922 Ziegfeld Follies production), Russell wanted to achieve absolute precision and ultimate uniformity in the movements of the dancers. 2. We weren’t always called the “Rockettes.” The dancers known as the “Missouri Rockets” made their show debut in St. Louis. That same year, the troupe traveled to New York City to perform in the Broadway show Rain or Shine and were discovered by showman S.L. “Roxy” Rothafel. The “Missouri Rockets” were such an instant hit that Rothafel was loath to let them leave after their performances at the Roxy Theatre. Rothafel pleaded with Markert to form another line to replace the departing “Missouri Rockets.” While there were three separate dance troupes performing in New York City at that time, Rothafel moved two of the troupes to Radio City Music Hall for its opening night on Dec. 27th, 1932 where they performed a routine to the song “With a Feather in Your Cap.” He dubbed the chorus line the “Roxyettes.” Two years later, the “Roxyettes” officially became the Radio City Music Hall Rockettes. 3. The Christmas Spectacular was originally 30 minutes. The original 30-minute live Christmas Spectacular, which debuted on Dec. 21, 1933, featured elaborate sets, sparkling costumes, performances from the Music Hall’s Corps de Ballet and Glee Club, novelty acts and of course, us Rockettes. Today, the show has evolved into a 90-minute extravaganza celebrating the holiday season to the fullest. 5. Over 3,000 women have performed as Rockettes. Since the Christmas Spectacular’s opening night in 1933, more than 3,000 women have shared in the legacy by performing as a Rockette. It’s the ultimate sisterhood! 6. Millions (and millions!) have seen the show. The Christmas Spectacular has been seen by more than 75 million people since the New York holiday tradition officially began in 1933. 8. Those animals walking across the Great Stage are real! During the eight-week run of the show, the real-life camels, sheep and donkey in the “Living Nativity” number drink 450 bottles of water, eat 340 bales of hay, munch on 560 loaves of seven-grain bread and exercise daily with early morning and late night strolls on the streets outside the Music Hall—an occurrence that has surprised more than a few New York night owls and midtown commuters. 9. There’s a morning and afternoon cast. 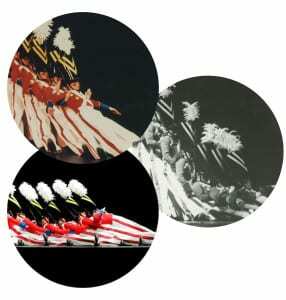 There are a total of 80 Rockettes—40 Rockettes in each cast, and only 36 of us perform onstage at a time. Each cast has four “swings” who can fill in the spots for nine of the women on the line. 10. We Rockettes need to be a certain height. Each of us has to be between 5’6″ and 5’10½” and must demonstrate proficiency in tap, jazz, and ballet. 11. Your eyes are deceiving you! 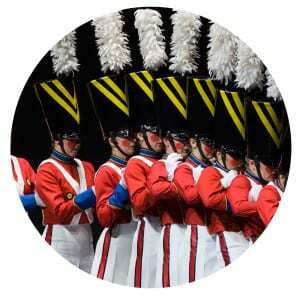 The illusion of our uniform heights has always been maintained by having the taller dancers in the center of the line and placing dancers of gradually decreasing height on either side, with the less tall women at both ends of the line. 12. We do our own hair and makeup for performances. We wear a signature red lip (either MAC Red or MAC Russian Red—both are blue-based tones that pop under the bright lights! ), false eyelashes and a French twist. 13. Wardrobe goes through 30,000 cheeks every season. Those rosy red cheeks we wear during the “Parade of the Wooden Soldiers” and “Rag Dolls” numbers aren’t makeup, they’re red felt circles that we fasten to our cheeks with double-sided tape or Vaseline. 14. Our shoes are mic’d up. This is so the entire audience can hear us dance the “12 Days of Christmas” and “Rag Dolls” tap routines. Wardrobe removes the heel and sole and inserts a custom leather sole that attaches to the bottom of the tap shoe. A new heel is made that allows a special cavity within the heel for the sound transmitter to be stored inside—this helps pick up the sounds of our taps (14,096 AA batteries are used throughout the run of the show!). 15. We can kick up to 650 times in one day. We do more than 160 kicks per show and perform in up to four shows a day during busy periods! 16. Over 1,100 costumes are worn by the cast in each show. More than 1,100 colorful costumes are worn in the Christmas Spectacular—from us Rockettes to the ensemble and singers. 17. We’re pros when it comes to changing costumes. The quickest change occurs between the “Parade of the Wooden Soldiers” and “New York at Christmas” numbers, where we have 78 seconds to change in the wings of the Great Stage—with the help of our dressers, of course! 18. Our wardrobe department does loads (and loads!) of laundry. Over 350 loads of laundry are done per week, for 16 hours per day during the week and 20 hours per day over the weekend. The cast’s shoes, laundry, and costumes are stored in 180 laundry baskets backstage for each show. 19. There are over 1,100 pairs of shoes worn in each show. 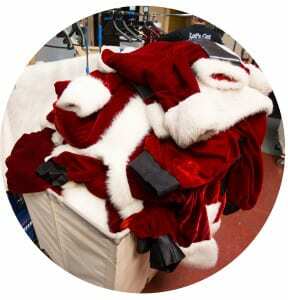 Between us Rockettes, the ensemble and Santa Claus, over 1,100 pairs of shoes are worn per show. 20. The ice rink in the “New York at Christmas” number isn’t real! The Christmas Spectacular features an “ice” rink built on a movable platform that’s used during the “New York at Christmas” scene. It’s made from an artificial surface with the same properties as real ice, with professional skaters wearing real ice skates to glide across the surface. 21. There are 11 large digital projectors used to project imagery. Radio City Music Hall is one of the largest indoor theaters in the world. During the Christmas Spectacular, there are 11 digital protectors that project imagery onto Radio City’s proscenium arches, creating visuals from Bethlehem’s starry night sky in the “Living Nativity” to Santa’s whimsical workshop in the North Pole. 22. More than 1,100 Stage Door Tours that are guided through Radio City Music Hall during the busy holiday season. Approximately 23,000 people tour the Music Hall in November and December. This tour allows visitors to learn about the architectural history of the Hall while experiencing the grandeur of the refurbished landmark. A sneak peek into the costume shop and the famous Roxy Suite (did you know this was Samuel “Roxy” Rothafel’s apartment?!) always proves to be a popular tourist draw. 23. Over one million pairs of 3-D glasses are handed out. 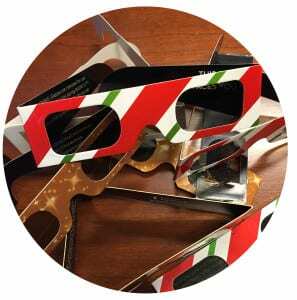 Each season, over one million pairs of 3-D glasses are handed out to audience members so they can experience the 3-D animation when Santa flies to New York.